Should I buy my leased car? Time sure passes quickly. Here you are, standing in your living room, staring out the front window. It seems like only yesterday that you brought your brand-new baby home, invited the neighbors over and proudly showed her off to everyone. But now, in what seems like a blink of an eye, it’s nearly four years later and time is almost up. You have to face the fact that, although she’s still your baby, she’s not a baby to anyone else anymore. And she’s certainly no longer brand-new. It can’t be put off any longer. Deciding whether or not to purchase your leased car at the end of the lease period actually requires answering a number of questions. The best one to start with is: “Do I still love it?” That may not seem like the most practical question, but it is probably the most important. Before running the numbers, you need to decide if you will continue to enjoy driving the same car, especially considering that it is bound to start costing you more money for maintenance and repair. Until now, the car has been under warranty. It won’t be anymore. Remember, if you purchase your leased vehicle, it will likely be your main mode of transportation for many years to come. If that is fine with you, then it is time to run the numbers. We are not talking here about what your car is worth to you personally or emotionally. We’re talking cold, hard, dollars and cents. The two numbers that you need to be most concerned with are your vehicle’s residual price and its market value. The residual price is what the lender, at the time the lease was written, estimated the vehicle would be worth at the end of the lease period. It is also the guaranteed price for which you can purchase the car according to the lease terms. The market value is just that: the amount that your car would sell for on the private open market today (or more precisely, at the end of the lease period). The bottom line is actually pretty simple: if you like your leased car and wouldn’t mind owning it, and the residual value is less than the market value, then go ahead and buy it. Since the purchase price is less than what the car is actually worth, you will be getting a bargain. 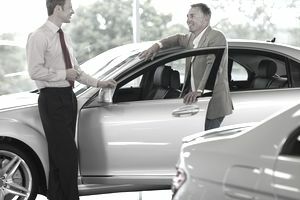 By the way, you might still consider purchasing your leased car even if the residual price is higher than the market value, especially if the difference between the two values is slight, say, a few hundred dollars or so. This is particularly true if you have kept your leased vehicle in tip-top shape. If, however, the residual price is substantially more than the market value, or if you have been, let’s say, less than kind in the care and treatment of the car, it will probably be in your best interest to turn over the keys to your lender and walk away at the end of the lease. Did I say it was pretty simple? It is, but there are a few other factors to consider. First, if you have exceeded the mileage limit for the lease term, or the vehicle has damage beyond normal wear and tear, then your lender is going to penalize you for that when you turn your car in. That amount could be substantial. If you purchase your leased car, however, you will avoid having to pay those penalties. Second, you may be able to negotiate with your lender on the purchase price. For example, if the residual price for your car is substantially higher than the current market value, then your lender may be willing to lower the purchase price a bit. It would be to the lender’s advantage to take a little less money from you rather than to go through the cost and hassle of taking the car back and putting it on the market only to sell it for a lower price to someone else. Your lender’s willingness to negotiate is by no means guaranteed, but it never hurts to ask. Finally, if you are at the end of your lease period and just can’t make up your mind, check your agreement. You may have the option of extending your lease for several months. You would be kicking the can down the road a little, decision-wise, but sometimes a little more time with your baby is just what you need.